“When I came here the first time, I thought, ‘Where have I seen this before?’” said Aly Anink, assistant race officer. “I realized it was in the history books at school. Walking here is like going back in history,” she said, and we all hiked the somber slave trail, and explored the fort and relics. The fleet rallied for dinner that night at the Harbour Club along the waterfront. Instead of plastic wristbands to distinguish our group, we were assigned colorful fabric bracelets laced with wooden beads, which we wore the rest of the trip. 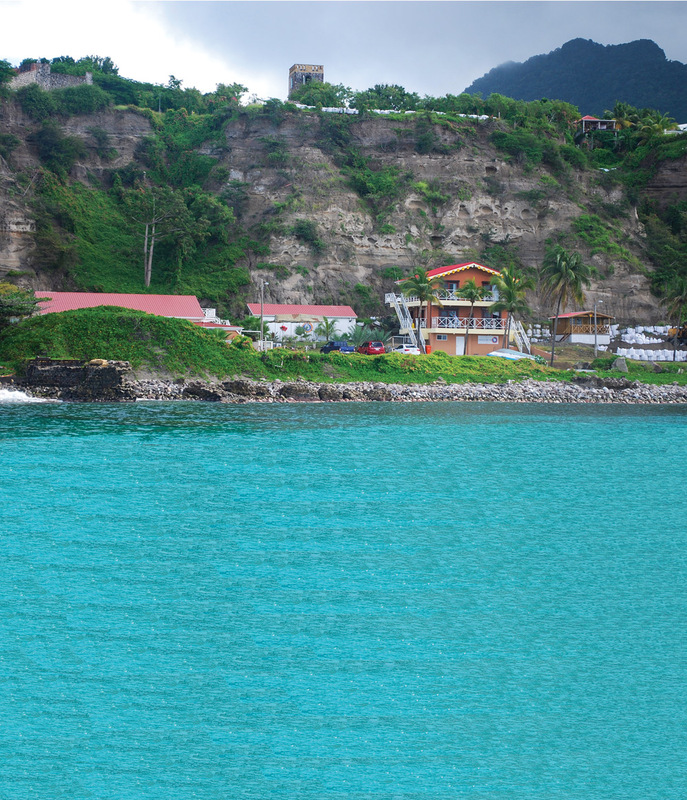 Statia’s Fort Oranje stands watch over Statia’s harbor as it has for centuries. Next stop, St. Barths. 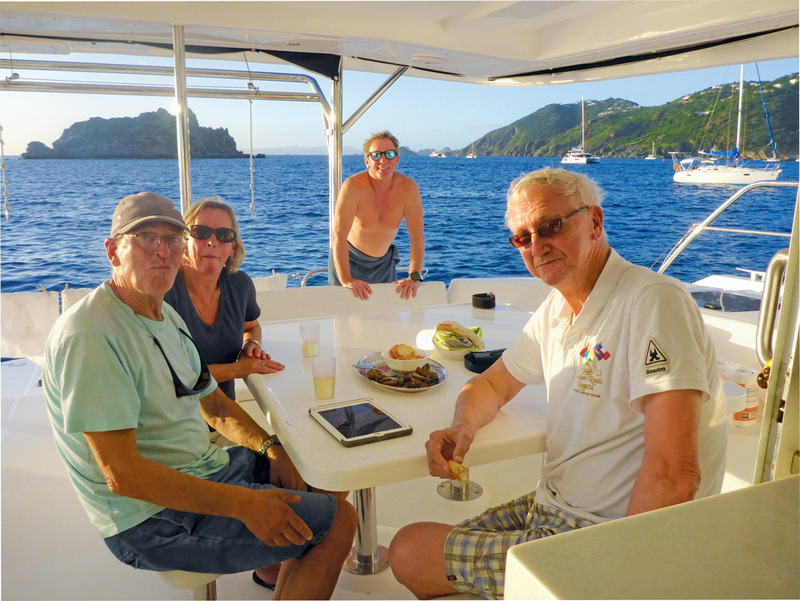 Charging around the south end of Statia past Fort de Windt, it was a lively reach to the charming and chic capital of Gustavia. In previous years the fleet Med moored inside the posh harbor; hopping from boat to boat, dancing and nattering in a mishmash of accents and dialects. But this time we anchored alongside the fairway, near the other competitors. Promptly Team Statia’s Leo Ligthart swam over. Ligthart, who lives in St. Maarten, has participated in nearly every GRR. Ligthart said he and his teammates often felt anonymous at the mega-regattas. “Racing around buoys is sometimes nice, but if you’re on the water with 200 other boats, it can be pretty stressful. Later that night we went ashore, but didn’t spot Jimmy Buffett, like we had several years before. But we did enjoy gourmet dining, before preparing for the next leg. As is often the case with yacht races, there is attrition; and by this point in the particularly windy regatta, a mere two boats would be competing in the leg to Anguilla. Ligthart’s Team Statia was in the lead, with the Canadian Yankees nipping at their heels. The race committee enjoyed breakfast aboard the chartered Moorings catamaran. Peter Anink said the organization maintains the right to modify the route to suit the sailors desires and the conditions. In the past the course has included the island of St. Kitts, an around-the-island race, a day of buoy races, and when the wind made a rare departure, even a rolling start. Anink and his wife Aly are both certified race officials, working together in that capacity for three decades. “We do it for a hobby; doing it together is a big part of the fun,” he said. “This regatta is one long party, in the most beautiful part of the world,” Aly Anink added. Finishing in Road Bay, we invited the entire fleet aboard our roomy vessel for happy hour, thankful the fridge and systems were in great working order. An impromptu leg to Tintamarre Island followed the next day, so sailors could snorkel after the race, before returning to St. Maarten, where the Yacht Club at Isle De Sol hosted our prize giving and feast. Hermsen seemed to have a trophy category for each entrant, and everyone walked away with some loot.